Every week, Dungeon Magazine presents 4th Edition Dungeons & Dragons adventures as well as crucial advice for Dungeon Masters on D&D Insider. Whether you're looking for ready-to-play adventures or building your own D&D campaign, Dungeon has something for you! 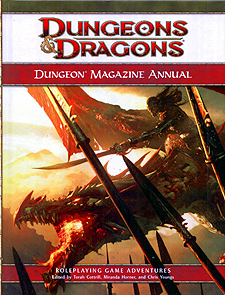 The Dungeon Magazine Annual collects the best material published by Dungeon Magazine since the launch of 4th Edition. Within these pages, you'll find thrilling adventures for various levels of play, all of which fit easily into a Dungeon Master's homebrew campaign. For use with these 4th Edition Dungeons & Dragons products: Player's Handbook core rulebooks, Dungeon Master's Guide core rulebooks, Monster Manual core rulebooks, D&D Miniatures and D&D Dungeon Tiles.